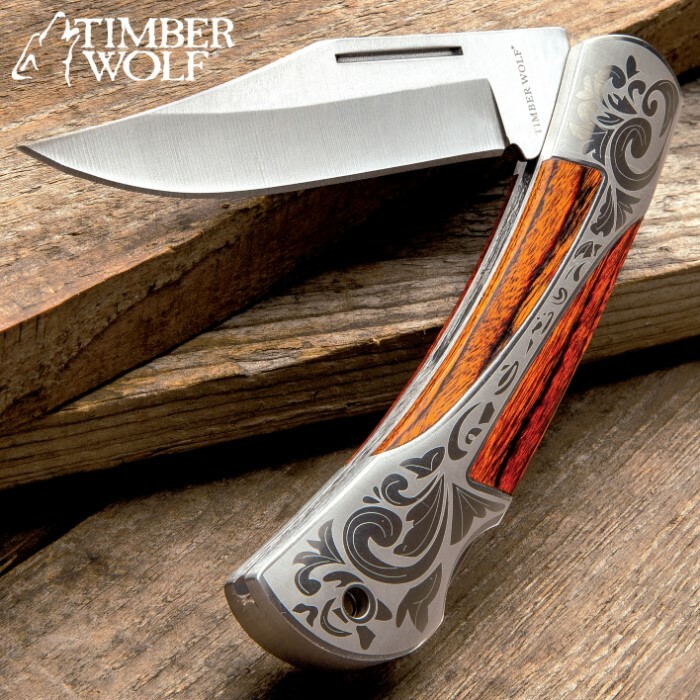 Timber Wolf Gentleman’s Lockback Pocket Knife | BUDK.com - Knives & Swords At The Lowest Prices! 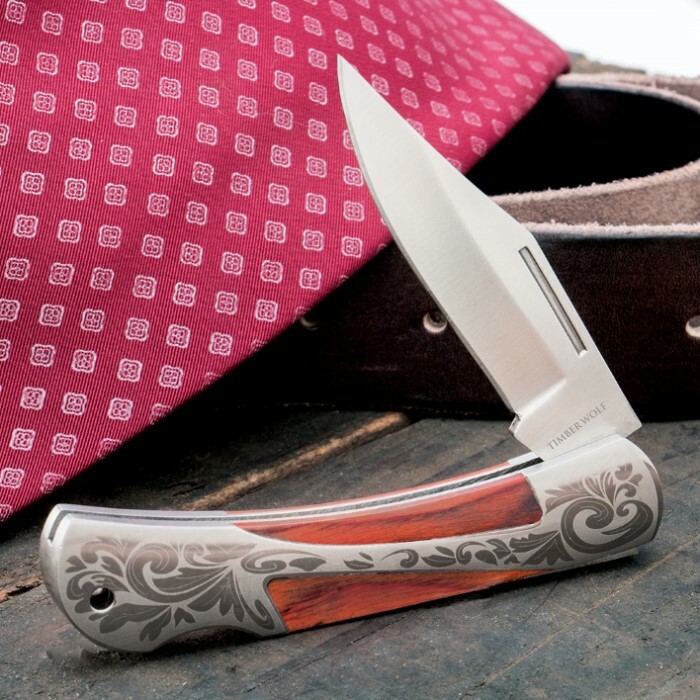 A smooth, elegant design, combined with rugged functionality, this gentleman’s lockback pocket knife from Timber Wolf is equipped with a 3 1/4" razor-sharp stainless steel blade. The elegant custom handle features wooden inlays and the nickel silver bolsters with intricate scroll designs complete the design. The pocket knife is 7 1/2" in overall length. Timber wolf at their finest. My fifth timber wolf and they all still work well!!! Beautiful knife, better than the picture. 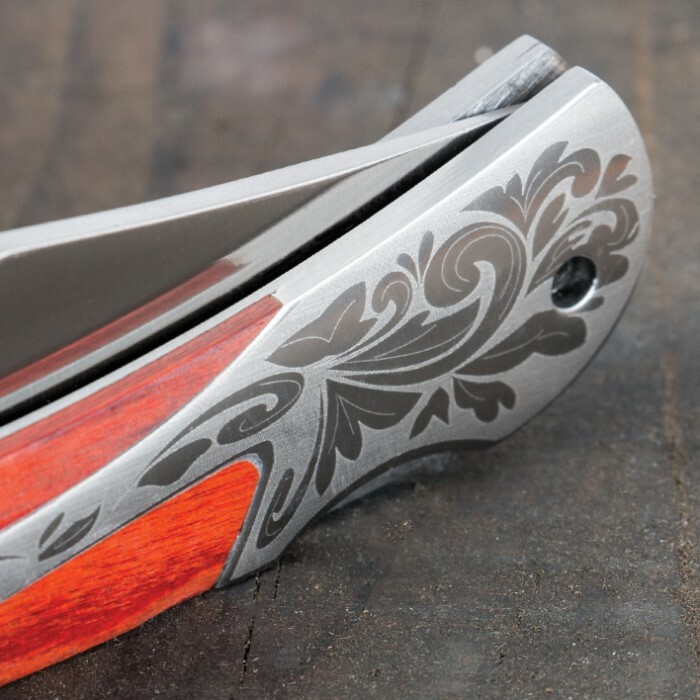 Amazing and beautiful pocket knife! Works for a great gift for someone who likes pocket knives. Beautiful ,well made,better than I expected. Great fit and finish. Just bought my 2nd one. Feels expensive. Solid lockback . The first time I bought only one and sold it to a man who usually only buys trappers. He loved it and I made five dollars. I just ordered two more and also two Brown Mules and two Smith and Wesson knives and I also bought my wife a pink stun gun. The Timberwolves is a very strong and sharp knife. This knife is fantastic. As sturdy as it is handsome. I'll make this short by saying I bought one and was so impressed when I got it that I immediately ordered 2 more. One as an edc to beat up, one to keep pristine, and one for my brothers birthday. His birthday is not for almost 4 months but at this low price I assumed they would run out. I am an avid Budk shopper and this is definately one of the best deals I've gotten on here. I'm tempted to order even more because they are of such great quality and so good looking for so cheap. Highly recommend, very sturdy with good weight makes knife very functional. I would say this knife will not let you down.